An intensely entertaining, educational and exhaustive documentary defining its essential character from start to finish. Moving in the Moment is an intensely, entertaining, educational & exhaustive documentary defining it's essential character from start to finish! It's all here!... 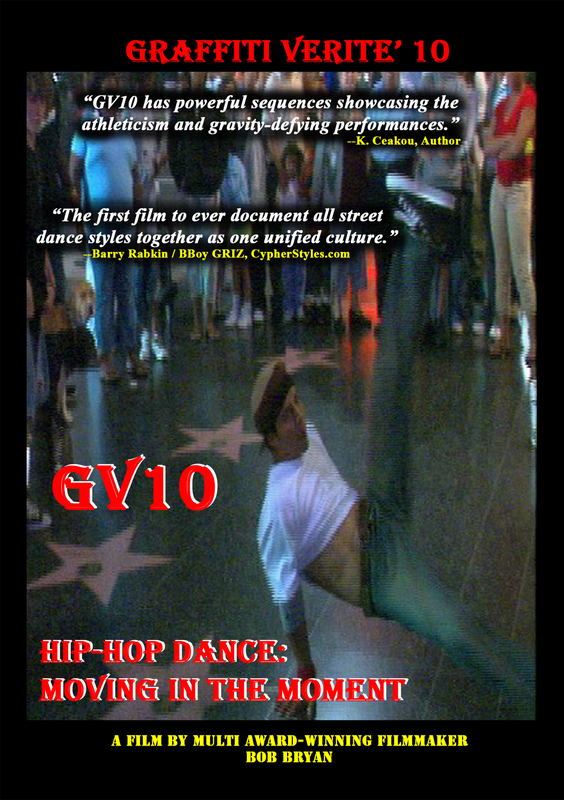 GV10 HIP-HOP DANCE is an engaging documentary (from multi award-winning filmmaker Bob Bryan) that personalizes the Hip-Hop dance experience for those artists who "live it" to those of us who "receive it". This specific and complex text, this living, dynamic kinesthetic language is borne out of their life experiences, the love of the game and the music that moves them. Whether you call it Breakin', BBoyin', BGirlin' or simply Hip-Hop Dance, what we witness here is authentically Funky and Soulful. These talented & expressive dancers strive to be "in the moment" and when it's good, what gets expressed in movement, is spirit-filled, awe-inspiring and explosive! Moving in the Moment exposes the creativity of eclectic Hip-Hop Street Dancers & Professional Hip-Hop dancers as well; all nicely juxtaposed together in this appealing professional presentation. In GV10, these incredibly diverse dancers articulately detail their incredulous inner discipline / journey and clearly represent their personalized Hip-Hop Dance art form, sharing their unique acrobatic, rhymic and unbelievable mind/body-bending dance styles. This documentary is a huge treasure trove of contemporary street dance, taken to the next level! An invaluable visual tome with invaluable insights into the pathos, joy, discipline and history of this worldwide urban culture called Hip-Hop. If you care at all....GV10 belongs in your DVD collection. Don't sleep on this one!!! Judge for yourself....or as Original Skeeter Rabbit (Original GoGo Brother & Locking Pioneer who performed with the Lockers) proclaims: "Educate before you Recreate." Starring: Mike Perry, Darius Frye, Peter Quinanilla, Emjay Delawcruz, Kian, Loan Hoang, Bboy Tailz, Jacob "Kujo" Lyons, Fresh, Cynthia Pereira, Boogie Frantic, Bboy Pan, Bboy Bert, Jonathan Parades, James Higgins, Go Hamada, Russell McFadden, Affion Crockett, Bboy Milky, Eddie Nunez, Jordan McLoughlin, Justin Bua, Keidi, Obi Awadu, Jeffrey "Machine" McCann, Sarah "Smalls" McCann, B-Girl Peppa, Gyroe The Magnificent, and James Santago.